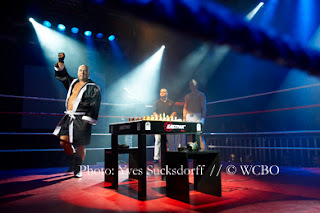 Chessboxing - I wonder how come a total action sport which is BOXING combines with a full mind game which is CHESS will be introduced to our fellow pinoy sports enthusiast. The two events will be combined as one sport so called chessboxing. 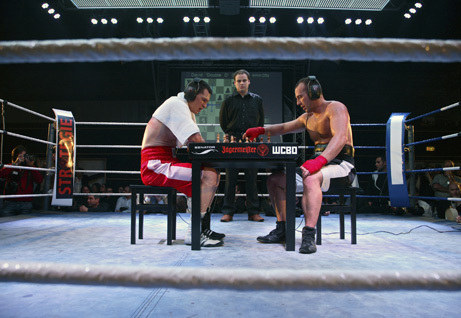 When I imagine that sport, it sounds that it will not be possible at all time but after I read some resources from the internet, I agreed it does exist, popularized, and an event to other country which amuses all the boxing fanatic and chess fanatic all over the world. For all of us fellow Filipino aka Pinoy, not be surprising that boxing is the number one pinoy sports in our country Philippines, concepts are Pinoy boxing enthusiast would go for boxing rather than that being educated in schools and one of the top pinoy boxers the likes of Manny Pacquiao - the best pound for pound boxing king, Nonito Donaire - The Flash currently top 3 in Ring Magazine, rising star Rey "boom-boom" Bautista at Pinoy Pride, AJ "bazooka" Banal, Jason Pagara, and many more contingent pinoy boxers. But most of them didn't finish a highest degree of education, they preferred being a professional boxer than to be a degree holder professional - because that's their way to uplift life and their country, in their interviews and that's fact to be fame and sustain their financial growth - that's all about boxing career. Edging to pinoy chess mind, here we are excel to the top level where the likes of GM Wesley So, 17 year old chess grand master and the country's top chess player and belong to top 100 all over the world - and that boy is our country's pride in chess battle. The likes of GM Antonio Rogelio - the country's secod top chess player, GM Eugenio Torre - The Asia's first chess grandmaster ever happen to our country. And many rising GM's including GM Oliver Barbosa, Richard Bitoon, Kim Steven Yap, and many more aspiring pinoy chess masters. These are the excellent Pinoy for battle of the mind. Is this would be possible for pinoy to excel both in one action? Probably yes, and maybe not, because it depends on the drive of the individual enthusiasm, If he will go for the two, or to remain from the usual one. I do promise that these would be the most exciting sport to be exist here in our country. Can you imagine to win via technical knockout or checkmate? A round one would be boxing, and next round is chess?Would it be in your mind out of the frequency?Not relating to marathon - running,swimming,biking, any combination. This is unique sport to be happened, from body action to mind action or from mind action to body action, it tests both body toughness and mind toughness - and that would determine a true warrior in both body and mind. Physical and mental training are required in this sport, both chess and boxing fanatics would gather here. And it's all about the sports being love and put into, giving you some resources and reality show - Pinoy Thinks.